Sri Vikku mama’s family needs no introduction. Their bhakthi towards Periyava cannot be explained in words. Their bhakthi towards Pradosham Mama cannot be boxed into mere words either. 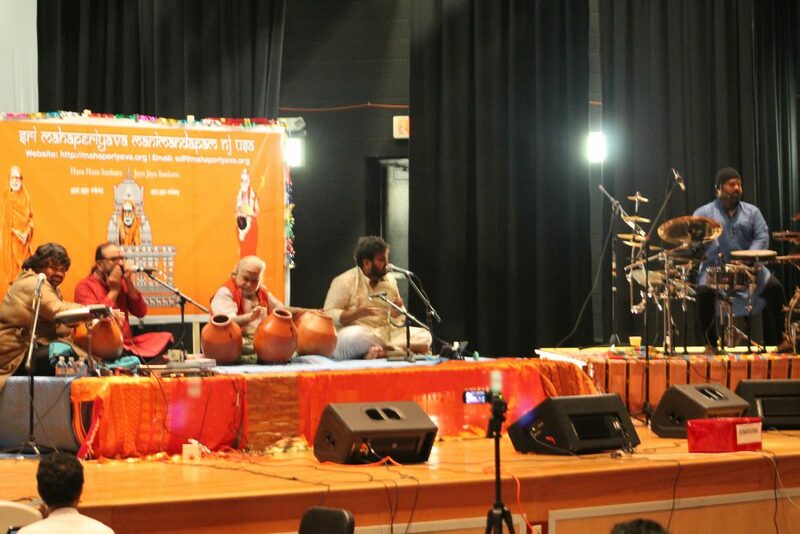 Here is Mama’s son Selvaganesh, Uma Shankar and Selvaganesh’s son Swaminathan along with Sri Vikku Mama talking about Periyava, Pradosham Mama & Mami during a satsangam in aid of Sri MahaPeriyava Manimandapam NJ USA. 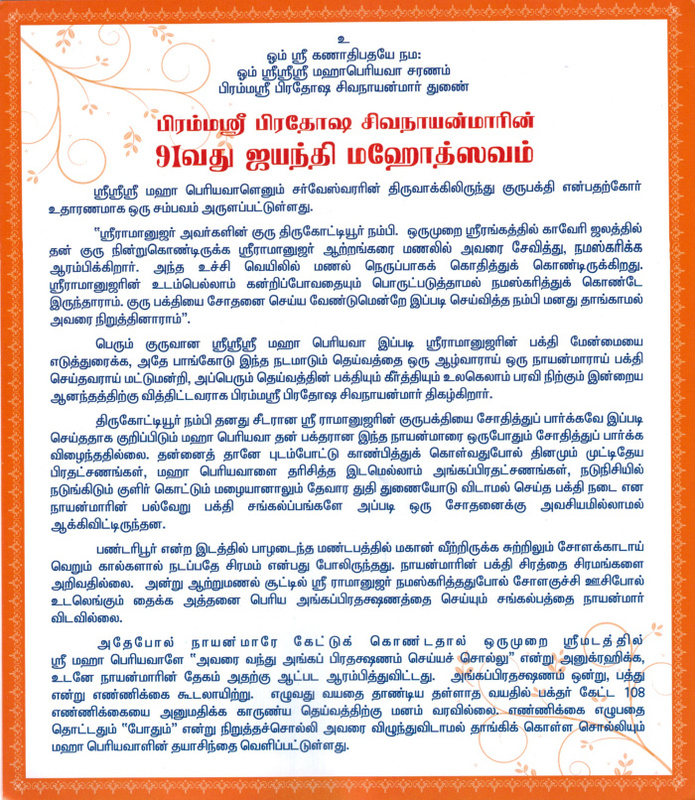 Sri Mahesh Vinayakram who couldn’t join the satsangam at that time had sent a separate video sharing his words as well. 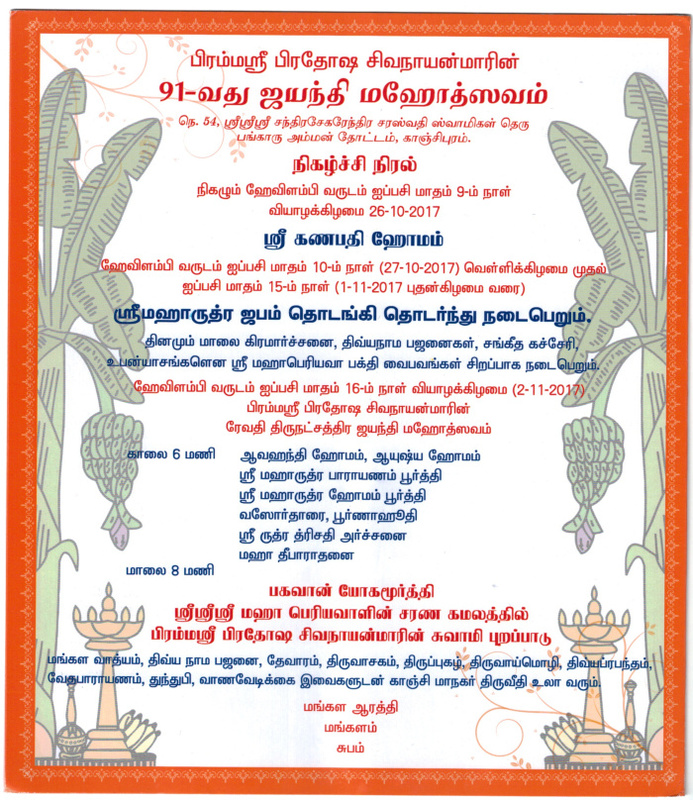 Together, as we all know, Sri Vikku Mama’s family is not only a STAR in musical world but also in Pradosha Mandalam. 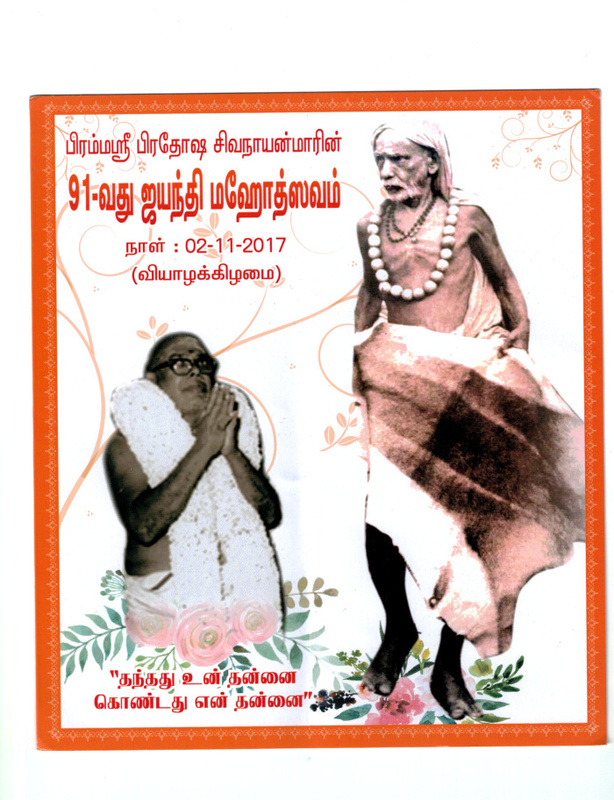 During the auspicious occasion of Sri Pradosham Mama’s 91st Jayanthi, let’s listen to this THREE GENERATION of Periyava Bhakthas who immerse us into HIS SMARANAI… Kindly scroll down to get details on Sri Pradosham Mama’s Jayanthi. Sri MahaPeriyava Manimandapam – Orikkai – This architectural marvel owes its existence to the unparalleled devotion of “Pradosham Mama” in the circles of devotees of Sri Matam in Kanchi. Sri Selvaganesh silences the noise “Pradosham Mama did not live up to see the Kumbabhishekam of Orikkai Sri MahaPeriyava Manimandapam” through his pious words. Smt Vedambhal – Sri Pradosham Mama’s Dharma-Pathini – Vikku mama’s family has so much to say about Her nobility. 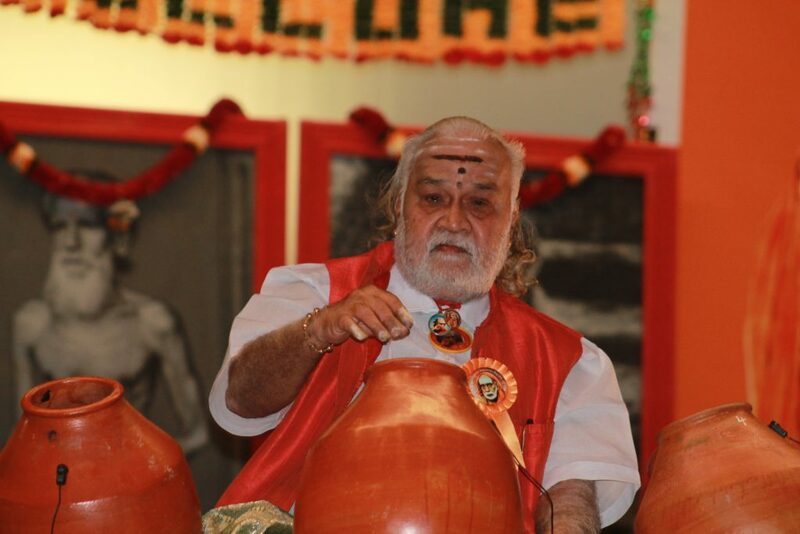 “ஊதுவத்தி ஏத்துடா, பெரியவா உன்ன மனமா வெச்சுப்பா” – Sri Mahesh Vinayakram shares all about the Shuddham, Shraddhai, Bhakthi, Bhavam that Sri Pradosham mama in instilled him. His emotional bonding with Sri Pradosham mama shows how much Bhakthi-Bhavam has mama fed to this family! SRI PRADOSHAM MAMA was a true and ardent devotee of SRI MAHA PEriva of KANCHI.He is rightly called as 64th Nayanmar.Some call SRi Kripananda Swamigal also as 64th Nayanmar. Leave that there. IT is a great blessing to be near Sri Maha Periva and serve HIM .In that aspect only very few are fortunate to have that closeness with Maha Periva . PRODHOSHAM Mama , Sri BALU MAma, and Sri RA.GANAPAThi Sir, are few among such fortunate souls.I firmly believe all Periva’s Ardent devotees will now in the company of SRI MAHA PERIVA in the heavenly abode to serve HIM there. I pay my respectful homage to SRI PRadosham Mama on the auspicious occasion of his Jayanthi Day. Can anyone help me find the slokam which is mentioned in this interview for kaariya Siddhi? Great interview on the auspicious occasion of Sri Pradosha Mama’s jayanthi day. Very fortunate to hear and know what true surrender to a guru is. Those who had the fortune to be with Pradosha Mama must be blessed as he could show the way to reach and get the grace of the guru. Sri Maha Periyava Thiruvadigal Saranam. Sri Pradosham Mama Thiruvadigal saranam. Guru Paduga saranam. Brahmasri Pradosham Mama have shown us what is Guru Bakthi. By reading and hearing about Pradosham Mama, many have turned a new leaf including me. My respectful pranams to Mama on this auspicious day.